I don’t like to shop. My idea of shopping is to know exactly what I want at the store and the aisle that contains the product I need. In, out, done. I was recently in need of a new set of kitchen knives. Over the years I have sharpened and resharpened the set of Chicago Cutlery knives that my wife and I received as a wedding present. Replacement of the worn-out set was not a problem for me. There is a retail store where I have “shopped” on numerous occasions, and I knew where the knives were located. In, out—wait. The knives were displayed next to the latest and greatest knife sharpener. I have a number of sharpeners, but I figured one more couldn’t hurt. Across the aisle from the knives was a display of spaghetti canisters; glass and stainless steel with a screw-top lid. I like spaghetti. It seemed only right that our noodles be kept in the latest kitchen storage innovation. In, out (not as fast as I had anticipated), done. Where am I going with this story? I take it for granted that the store down the street has everything I need. Imagine, if you will, that it was the year 1717 and not 2017, and I needed a new knife, a new knife sharpener, and a food storage container. If the store wasn’t there and I had to craft these items, how would I begin? 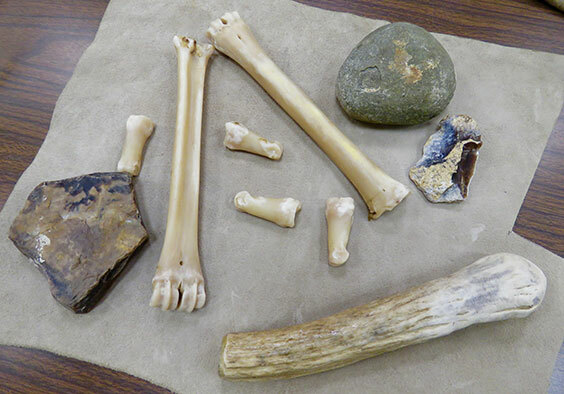 The State Historical Society of North Dakota (SHSND) and the North Dakota Archaeological Association (NDAA) are collaborating on a project that explores these questions and more. 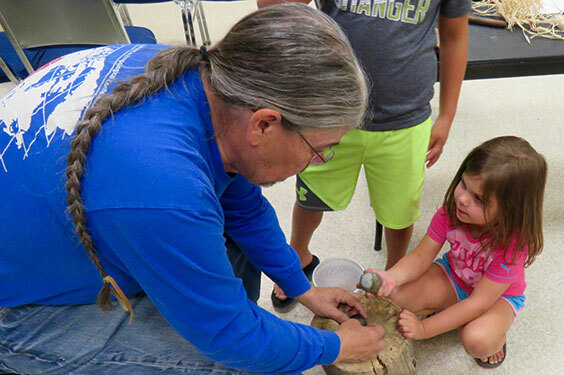 Every other Friday at 10 a.m., an “Experimental Archaeology” program is conducted at the North Dakota Heritage Center & State Museum. Some of the tools being used during "Experimental Archaeology"
In public learning spaces in and around the museum, flintknappers, potters, fire-starters, jewelry makers, and other skilled artisans replicate the processes that produced knives, storage containers, fire, personal adornment, and more before retail stores were available for replenishment. 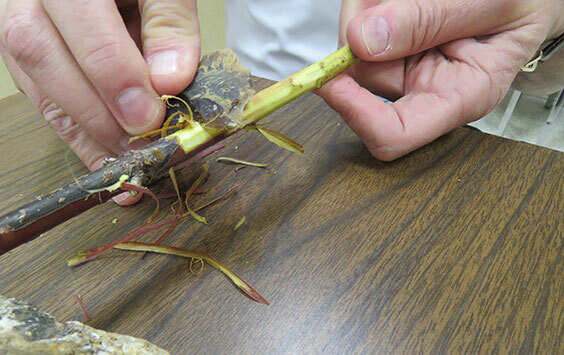 Using a piece of Knife River flint to remove bark from a willow branch to make a willow basket. When the bison was ready for eating, how would it be cooked and served? What if, instead of having glass and stainless steel containers, I had to fashion a pottery vessel by hand? Where would I begin? What type of clay would I use? How would it be tempered so that the vessel wouldn’t crack when fired? How would it be fired and at what temperature? How would I achieve the proper temperature? How would the container be shaped for proper heating, serving, and storage? How would the clay pot be incised or impressed for decoration and identification? These processes and many more will be replicated at the semi-monthly “Experimental Archaeology” sessions. Our sessions are loose, friendly, and inclusive. Everyone is invited, and no question is too trivial. A visitor recently asked how long it took to complete the pecking of a groove in a stone hammer. The answer was that you peck until it is done—this can take hours or it can take days, depending on the quality of the work and the resources available. Time takes on a different dimension if you are on a hilltop scanning for bison, looking out for the enemy, waiting for your clay pots to fire, or thinking about the angle of your next percussion strike while knapping a stone tool. “Experimental Archaeology” will put you in the same frame of mind. 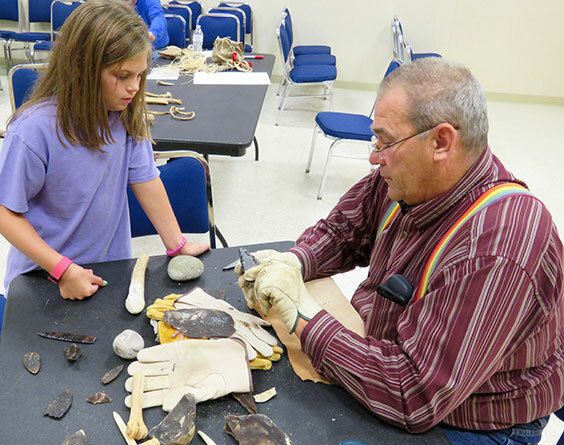 Erik Holland, Curator of Education for the State Historical Society of North Dakota, teaching the art of pecking a hammerstone. Join us for our next free sessions on August 11 and 25, 10 a.m. to noon, in Project Room A of the ND Heritage Center & State Museum. After several experiments, it is obvious to me that I will never be able to eliminate shopping from my life. I do, however, appreciate the gadget store down the street a little more.